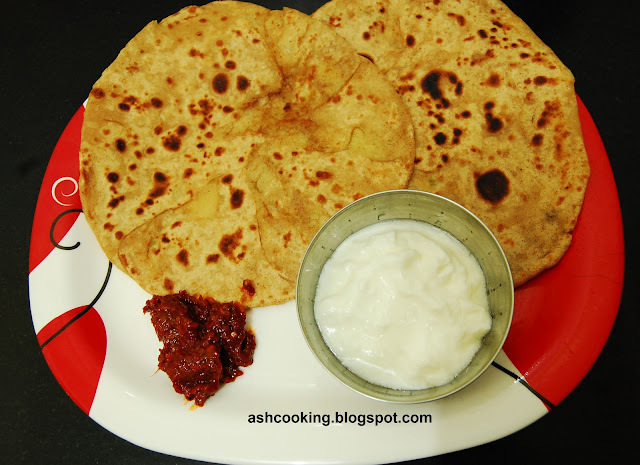 I literally drool over aloo parathas. They are my all-time favourite snack item. But as no good food is without its drawback and side effect, aloo paratha too is quite high in calorie albeit mouth-watering. Nevertheless, once in a while definitely we may allow ourselves the indulgence to fulfill our cravings, keeping every health related thought at bay. Ingredient: Cooking time: 40 minutes approx. 1) Knead whole wheat flour and yogurt to a smooth dough. Keep it aside for 30 minutes, covered. 2) Meanwhile, add all the spices, onion, green chillies and coriander leaves into the mashed potatoes and mix well. 5) Shallow fry the parathas in oil and ghee. 6) Serve hot with a pickle of your choice and yogurt.